The New Zealand Asia Institute team includes our Director, various researchers and an administrative team. Natasha Hamilton-Hart is Professor in the Department of Management and International Business. She has a BA(Hons) from the University of Otago and a PhD from Cornell University. Natasha joined the University of Auckland in 2011, after teaching at the National University of Singapore for ten years and holding a postdoctoral fellowship at the Australian National University. Natasha’s research focuses on business in Southeast Asia, particularly in the banking and natural resource sectors, as well as on foreign investment flows and financial regulation. She is the author of Asian States, Asian Bankers: Central Banking in Southeast Asia and Hard Interests, Soft Illusions: Southeast Asia and American Power, both with Cornell University Press. Her most recent research examines the palm oil industry in Malaysia and Indonesia. Dr Xin Chen joined the Institute in 1997. Prior to that she was with the East West Centre in Honolulu for 11 years, first as a degree fellow, then a research assistant and finally a research fellow. During that time she also gained her PhD in Political Science in the University of Hawaii. Prior to going to America, she was a lecturer at the English Department of Peking University where she received her BA and MA in English literature and linguistics, and then a senior lecturer at China Foreign Affairs University in Beijing. Her research interests focus on Chinese politics, and China and East Asian regional integration. She has been a key player in many of the Institute’s research initiatives. Charles Chow is the NZAI Asian Network Adviser. He is a business alumnus of the University, chartered accountant turned corporate/investment banker with JP Morgan Chase, equity research director, stockbroker and deal maker for DBS Vickers Securities. He retired from the financial industry after 13 years to manage a diversified investment portfolio. He is also a part-time senior tutor in the Department of Accounting and Finance. Based out of Singapore and Auckland, Charles develops business links for NZAI in Asia. His recent academic interests include the history of globalisation, FDIs in Asia and the future of emerging democracies and benevolent dictatorships of Southeast Asia and China. Dr Benjamin Fath joined the NZAI Institute in 2009 as a researcher. He has a Master of Commerce from the Justus-Liebig University, Giessen,Germany and a PhD in Management from the University of Auckland Business School. He has been centrally involved in two large scale research projects of the Institute, namely Business Engagement with Asia (BEA) and Growing New Zealand Businesses (GNZB) of which he is the project manager. His research interests include innovation, entrepreneurship and SME growth. Ben is currently a senior lecturer in the Graduate School of Management in the Business School. Christina is an Associate Professor in the Department of Management and International Business. Christina specialises in international business (in particular Asia and Latin America). She has undertaken extensive research into New Zealand’s primary industries including fisheries, dairy and forestry with a particular focus on Asia. Most recently she has been researching worker exploitation, and in particular migrant worker exploitation, in New Zealand’s deep-sea fishing industry as well as land-based industries. Dinah Towle joined the Institute in 2009 as Office Manager. Previously, Dinah had 10 years experience working for an international human rights organisation responsible for development of all administrative and financial policies and procedures and coordination of their fundraising activities. She has over 15 years experience in finance and administration in both the commercial and non-profit world. Hugh Whittaker is a Fellow of the New Zealand Asia Institute, and was Professor at the Department of Management and International Business at the University of Auckland prior to taking up the role of Professor in the Economy and Business of Japan at the Nissan Institute of Japanese Studies, University of Oxford. He has a BA from ICU, Tokyo, and a PhD from Imperial College, London. After carrying out postdoctoral research at Harvard University, he taught at Cambridge University for 12 years, before helping to set up a business school and research institute at Doshisha University, Kyoto. His research interests include Japanese and comparative management, innovation and entrepreneurship, and development models in east Asia. Recent publications include Recovering From Success: Technology and Innovation Management in Japan (co-edited with R Cole, 2006), Comparative Entrepreneurship: The UK, Japan and the Shadow of Silicon Valley (Whittaker et al 2009) and forthcoming Corporate Governance and Management Reform in Japan (co-edited with S Deakin), all from Oxford University Press. Dr Antje Fiedler is a Senior Lecturer at the Graduate School of Management. Antje has undertaken extensive research on the internationalisation of SMEs with a particular focus on emerging Asia. Her research has been published in international journals and has informed courses at the University of Auckland Business School and practitioner workshops around New Zealand. Mark R Mullins joined the University of Auckland’s School of Asian Studies as Professor of Japanese Studies in January 2013. Prior to this appointment, he was engaged in academic work in Japan for 27 years and taught at Shikoku Gakuin University, Meiji Gakuin University, and Sophia University, where he also served a three-year term as editor of Monumenta Nipponica. He completed his postgraduate studies in the sociology of religion and East Asian traditions at McMaster University (PhD 1985). His teaching and research focus is on the role of Japanese religions in modern societies both within and outside of Japan. He is the author and co-editor of a number of works, including, Religion and Society in Modern Japan (1993), Perspectives on Christianity in Korea and Japan (1995), Christianity Made in Japan: A Study of Indigenous Movements (1998), and Religion and Social Crisis in Japan: Understanding Japanese Society Through the Aum Affair (2001). He is currently engaged in research on neo-nationalism and religion in contemporary Japanese society. Dr Yuri Seo is a Senior Lecturer in Marketing at the University of Auckland Business School, and Director of Korea Studies Centre at the New Zealnd Asia Institute. In his research, Yuri focuses on how postmodern consumers acquire, utilise, cross-fertilise, and transform cultural resources for their personal and/or broader social needs. Currently, this encompasses three distinct streams of research: (1) digital consumer culture and behaviour, (2) luxury consumption and cultural branding, and (3) multicultural marketplaces. Yuri’s research has been published in leading academic journals, such as Journal of Advertising, Journal of Business Research, Marketing Letters, International Marketing Review, and Journal of Consumer Culture, among others. Natasha Hamilton-Hart is Director of NZAI and Professor in the Department of Management and International Business. She has a BA(Hons) from the University of Otago and a PhD from Cornell University. Natasha joined the University of Auckland in 2011, after teaching at the National University of Singapore for ten years and holding a postdoctoral fellowship at the Australian National University. Natasha’s research interests include regional integration and cooperation in East Asia, business in Southeast Asia and business-government relations, particularly in the banking and natural resource sectors. She is the author of Asian States, Asian Bankers: Central Banking in Southeast Asia and (forthcoming), Hard Interests, Soft Illusions: Southeast Asia and American Power, both with Cornell University Press. The New Zealand Asia Institute aims to facilitate collaboration among scholars active in research on Asia and promote the visibility of the Asia-related expertise of the University of Auckland. We invite current faculty members of the University of Auckland whose primary field of scholarship involves research in any country in the Asian region to be listed here as a Research Associate. Environmental science and management; western China. Human growth and development; China, Taiwan, remote Oceania. Twentieth Century social and cultural history, religion, diaspora. Innovation, technology develoment and management,global sourcing of services. International trade; economic reform and development. Strategic human resource management and Chinese leadership. Social work with ethnic minorities, social work leadership, workplace wellbeing, online learning and virtual communities in practice. Foreign language education; national language policy, Singapore and China. Primate behaviour, ecology and conservation. Education and peacebuilding; East Timor, Myanmar, Indonesia. Violent conflict, democratisation; Indonesia and India. Early modern (17th-19th Century) literature and culture. Linguistics, teaching Japanese as a foreign language. Social history, medicine, women’s history. Cultural identity and values in Korea. Geography, disaster risk reduction; Philippines and Indonesia. Natural resource governance; displacement; post-disaster recovery; Thailand, Cambodia and Indonesia. Business; global value chains; labour rights; Indonesia. Hindi cinema; South Asia: Ethnomusicology. International trade; firms; labour markets; institutions. 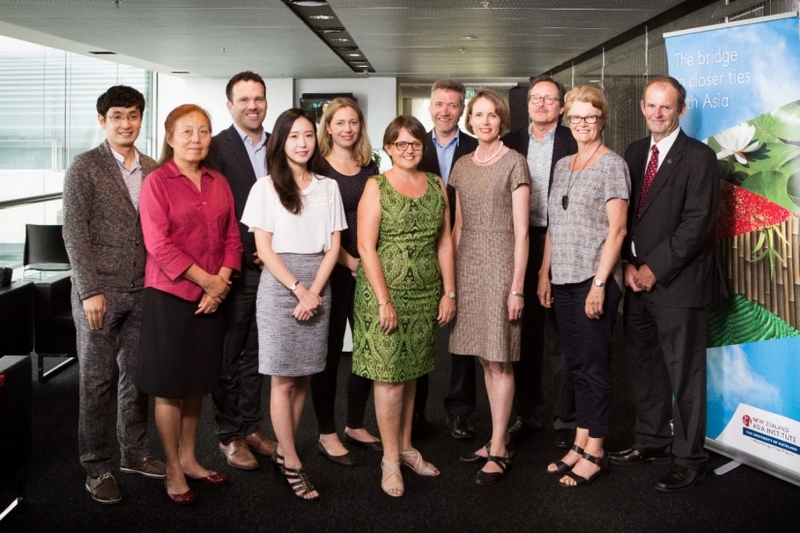 The New Zealand Asia Institute welcomes visitors who are researching topics relevant to the Institute’s work, especially where they are undertaking joint research with institute members. For details regarding the application process, please write in the first instance to Dr Xin Chen. We are unable to offer funding for visiting researchers. Current and former visitors of the Institute since 2012 are listed here.